In early art, the interiors of rooms only appear as the container for what is happening within them, and they are generally sketchily realized with a few salient furnishings. So, in a Pompeiian fresco (Museo Archeologico Nazionale di Napoli), an artist’s studio is represented simply by the ‘X’ stool he is sitting on beside a portico, a bolster with his box of colours, and a framed picture; intimate scenes contain little more than a bed and possibly a table, and are hardly interior paintings as much as islands of indoor activity. In the Middle Ages, interior scenes were slightly better realized; portrayals of births in particular – such as Pietro Lorenzetti’s Nativity of the Virgin, 1342, Siena – showed perspectival rooms with doors and windows; beds with realistic coverings, bedheads and pillows; patterned floors, wall hangings, rugs and chests. We can get quite an accurate picture of a middle class or aristocratic home from the backgrounds of such religious scenes, since – even in the wealthiest dwellings – the furniture would have seemed relatively sparse to modern eyes. Books of Hours and depictions of the Last Supper and the Annunciation are frequently rich in domestic detail: Jan Van Eyck’s studio miniature of The birth of St John in the Très Belles Heures de Milan, 1416, Turin, shows a bed with canopy, curtains and bedding; a cushioned settle; a coffer; a table containing a cupboard and lower shelf, a wooden chair, hanging shelves, pewter vessels, candlesticks and pet bowls. Interior paintings with the Virgin Annunciate, reading or feeding her Child, by Van der Weyden and Campin, are similarly full of lovingly observed fireplaces, window shutters, looking-glasses and vases of flowers. Further into the Renaissance we see the interiors of studies in the many depictions of St Jerome, with his reading slope, desk, chairs, window seats and shelves of books; whilst Ludger Tom Ring’s 16th century Marriage feast of Cana (destroyed), shows a detailed kitchen and scullery, complete with sink and pail of water, fireplace with suspended cooking pots, dressers, baskets of provisions, cooking implements, a large kitchen table and a covered buffet table. Here at last is a work which is almost more an interior painting than it is a Biblical episode, and from this point onward artists seem to be looking at the rooms where they site their subjects as much as, or even more than, the subjects themselves, which gradually reduce in relative scale and prominence. Frans Francken II’s Living room of Rubens’s house in Antwerp, Stockholm, heroizes the room above the two women and children occupying it, so that we hardly notice them over the gilded leather wall hangings, paintings, carpeted table, chest and chimneypiece. Interior paintings really acquire importance as a genre through the work of 16th and 17th century Flemish and Dutch artists, and – with the work of Van Bassen, for instance – we can actually title such a work ‘Flemish interior’, rather than call it after the activity within it. Out of these bourgeois and aristocratic living rooms and halls came the enthusiasm for depicting the state rooms of noble house, the art collections of princes and the cabinets of curiosities, which – at least in the first case – continues today. J.H. Schönfeldt’s Interiors with musicians, Dresden, shows double height salons full of tiers of paintings, scores of chairs, statues and cabinets, which (rather than the musicians) are the real subject. Such works may have influenced 18th century British interior paintings: Hogarth brings the settings of his characters brilliantly alive in his series, Marriage à la mode and The rake’s progress, so that we see minutely-observed chairs, tables, ornaments and overmantels which still manage to carry symbolic and allegorical values. Group and family portraits of the 18th century also depict their sitters in the salons and state rooms of their homes with an exactitude which enables historians to discover how the paintings were hung on the walls, how game tables were set up, and what the contents of a dressing-table would be. Zoffany’s portrait of Sir Lawrence Dundas with his grandson at 19 Arlington Street, c.1770, The Marquess of Zetland, is so accurately painted that we can identify the original frame still on the painting hanging on the overmantel, and verify the result of the bill for covering the walls of the room with silk. At this point we begin to see drawings and paintings of empty interiors, where the room is itself the protagonist: these are true interior paintings – quiet evocations of a particular moment in a room, which record its historical costume and the imprint of its owners. An anonymous Room in the Prinz-Max-Palais in Dresden, 1776, ex-Haberstock Collection, records an empty, sunny state bedroom, with canopied bed, prie-dieu, tables, desks, screens, chests of drawers and paintings, coloured in a harmony of green, white and gold which enhances its value as bringing serenity, an object which is collectable in its own right. French Rococo rooms, however, were still usually the setting for some event or gathering for which they were a background: mainly genteel, but also working-class, such as Ruspal’s Dressmaker’s shop in Arles, Musée Reattu, with its group of girls sewing amongst a collection of hanging dresses, screens, humble wooden chairs and fabrics. The 19th century produced hundreds of interior paintings (often in watercolour) of rooms inside palaces and aristocratic houses across Europe – sometimes with groups of family members and guests pursuing quietly domestic hobbies (singing, sewing, playing cards, reading, writing, chatting) – sometimes peacefully empty (Giuseppe Naudin’s 1830s watercolours of sparely furnished state rooms in Parma’s Palazzo Ducale; Elizabeth Shelley’s Drawing-room at Field Place, 1816, Keats-Shelley House, crammed full of tables, chairs and sofas, an organ, books and pictures). 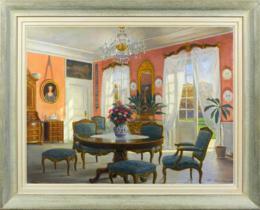 Russian, Scandinavian and Dutch interiors (by, for example, A. Redkovskij, A. Korinev, V.F. Bendz, H.F.C. ten Kate) record the different ways in which paintings were hung and furniture arranged from their analogues in Britain and France. Perhaps the apogee of this genre was the fist half of the 19th century; but it was so firmly established by then, and was so frequently practised by artists in their homes and by amateur painters that it continued in spite of the coming of photography, into the work of, for instance, Vuillard and Matisse. Interior paintings, like extended still life arrangements, bring a view of some unfamiliar and different harmony into the rooms where they hang, with the promise, perhaps, of another life and some utopian state of being.